The PR-22 UT is temporarily out of stock. Order today and Phantom48 will normally ship in about 4-5 business days. 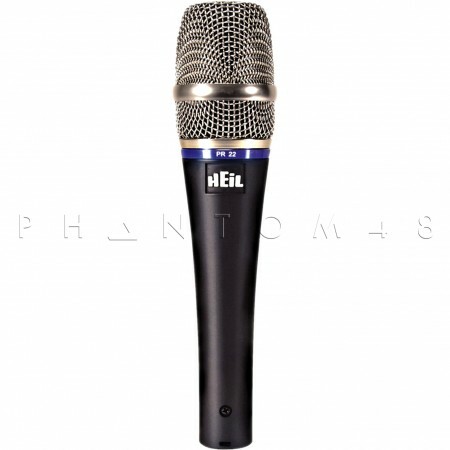 The Heil PR 22 represents completely new dynamic microphone technology designed for a wide range of professional applications such as live sound, commercial broadcast, and sophisticated recording. Never before has such quality been built into a dynamic vocal microphone. With its wide frequency range, outstandingly low handling noise and ability to handle +140dB SPL, the PR 22 outperforms the tired, 30+ year old industry technology. The end result is a microphone that can answer the call for any application. For example, the gorgeous articulation in the upper mid- range makes the PR 22 the best live vocal microphone, while its outstanding frequency response and superb dynamic range suit it perfectly for use with a snare drum or guitar instrumentation. 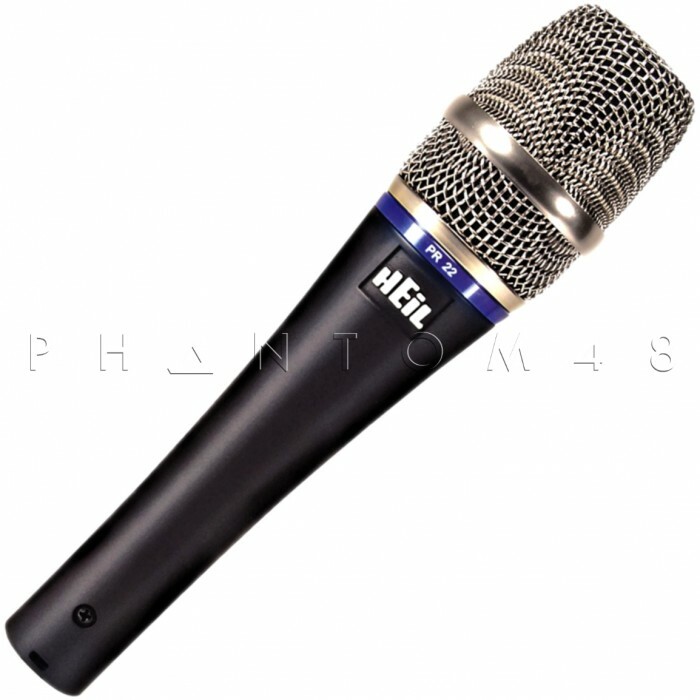 Since 1982, Heil Sound has been the leading manufacturer of communications microphones and has a paramount understanding of phase co-herence. When properly applied, this knowledge creates an outstanding linear cardioid pattern with up to 40 dB of rear rejection that removes unwanted sounds that try to enter from the off- axis rear. The pattern of the Heil PR 22 is outstanding. 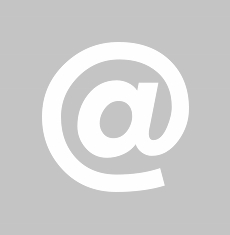 No hot spot or unwanted proximity effect. This exceptional performance is achieved by using the ideal combination of materials for the large 1 -1/8' diameter low mass diaphragm and a special mixture of neodymium, iron, and boron that gives the PR 22 the strongest magnet structure available. Handling noise occurs from 50 to 100Hz The popular ball microphones band stop their low end response at 125Hz to eliminate handling noise. Of course, they throw away an octave and a half of YOUR voice but you DO have low handling noise! Using the wide 50 Hz. to 18kHz response of the popular PR 20 diaphragm it was necessary for Heil to develop the ISO BAND tm, (patent pending) a special suspension system to eliminate low frequency handling noise. This new technology has brought an exciting new dimension to this amazing dynamic vocal microphone. 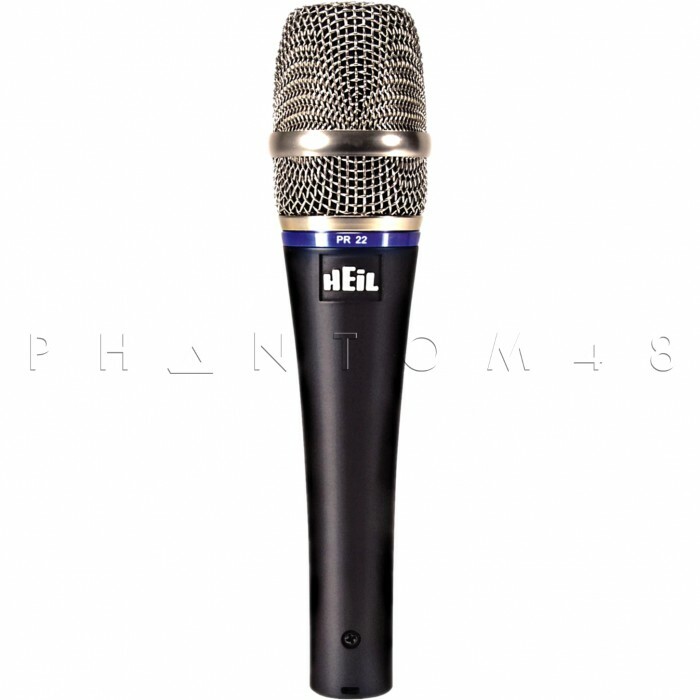 This new Heil microphone is usable with extreme high sound pressure levels to nearly 150 dB making it perfect for live vocal and instrument applications as well as a superb microphone for serious recording studios.